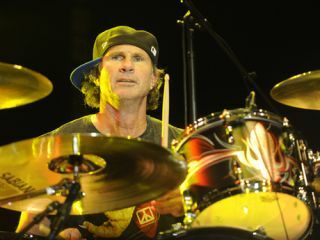 Another day, another quote suggesting that Chad Smith's time with Chickenfoot could be coming to an end. Chad told Billboard.com that the rest of the 'Foot know the score - his Chili Peppers commitments mean he isn't free to tour with the Sammy Hagar-led hard rockers in 2011. He said: "We just want to make a great record, and when it comes time to tour they can get somebody they want to play with. It's fine with me. There's a bunch of people that always call me and say, 'Hey, I hear you're not doing Chickenfoot. I want to do it.' So they'll find somebody good." In a recent interview with MusicRadar.com, Chickenfoot axeman Joe Satriani suggested that Tommy Lee, Abe Laboriel Jr and Jason Bonham are among those he has in mind to step into Chad's shoes.